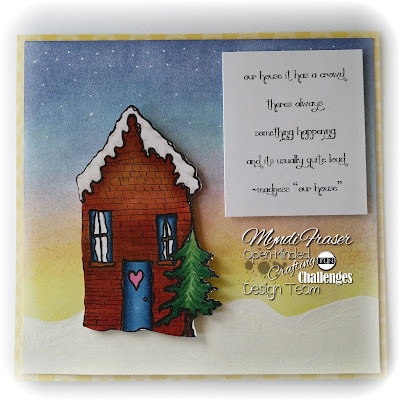 Another challenge is happening at Open-Minded Crafting Fun and the theme this time is "Inspired By A Song". We have more awesome sponsors for this challenge offering up some generous prizes for the winners, which are drawn by random: Chi Chi Memories (1 free digi under $3.99 and a 15% off coupon); Enchanted Design Studio from Concetta Kilmer (3 images); Wonderstrange (a custom digi); Sentimental Susan (5 images). I used the image "Home Sweet Home" by Wonderstrange. As I was deciding which image to pick, I saw this house and immediately thought of the song "Our House" by Madness. I think the lyric here is definitely representative of my house. It's always loud and there are always a lot of people. 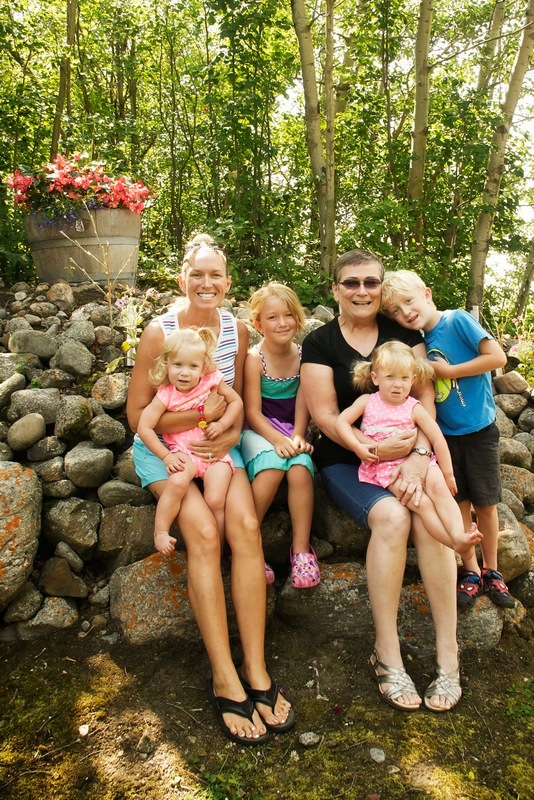 I have five kids, how can there not be?? I made the background with Distress Inks in Squeezed Lemonade, Victorian Velvet, Tumbled Glass, Broken China, Chipped Sapphire. I used a white Molotow marker to make the snow falling from the sky, and a white Sharpie marker pen for the snow on the ground. I coloured the home with Copics and used a permanent fine tip pen to draw in "bricks". I hope you like it. It was fun to make and I will have to have another go at the background. It turned out pretty well! The deadline for this challenge is midnight June 5, so head over there and show us what song inspires YOU! 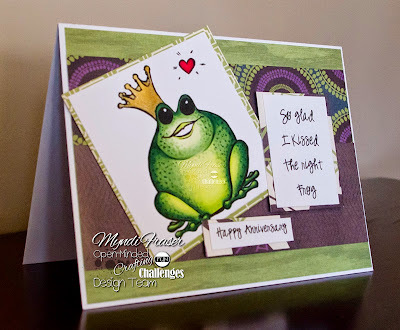 It's an easel card challenge this Tiddly Tuesday over at Tiddly Inks. This was so much fun to do! I had never made an easel card before, so good thing I got a Cameo for Christmas and was able to make this tea/coffee cup card which matches perfectly with the Wryn Thanks A Latte stamp. Everything came together for me making this card. I had little flower brads that perfectly matched the paper I wanted to use, so instead of using patterned paper for the cup and saucer, I used the brads to decorate them. I coloured this with Copics and the paper is from my stash. I lost the cover to the stack, so I can't tell you what brand it is, but I've had it for ages. All of the paper is from the same coordinating stack. 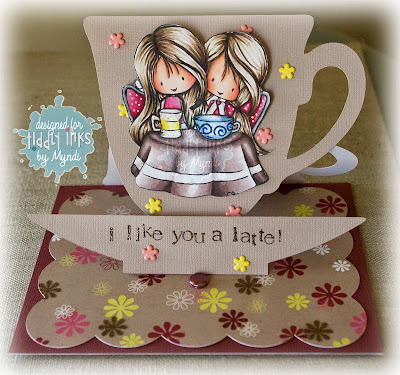 I used the Lori Whitlock coffee cup easel card design from the Silhouette design store for my card. Make sure you head over to the challenge blog and join in on this easel card challenge! The challenge lasts two weeks. Thanks for stopping by!! I hope you liked it! 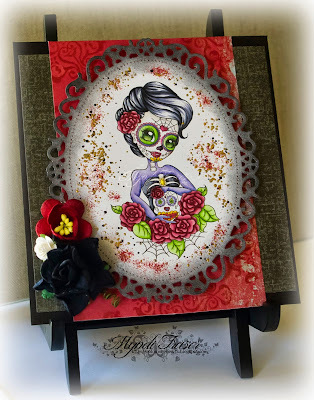 It's another DT inspiration week at Slinky Tart and this week I have coloured up Dayna of the Dead. I coloured her with Copics after cutting her out with a Spellbinders die. I used Aged Scarlet Frantage around the image and then applied Black Soot Distressed Ink by Tim Holtz to the outside edge. I finished it off with a couple flowers from I Am Roses and used some scrap pieces of paper from my stash for the mat and the base. I hope you like how she turned out! Thanks for stopping by! Hello all! 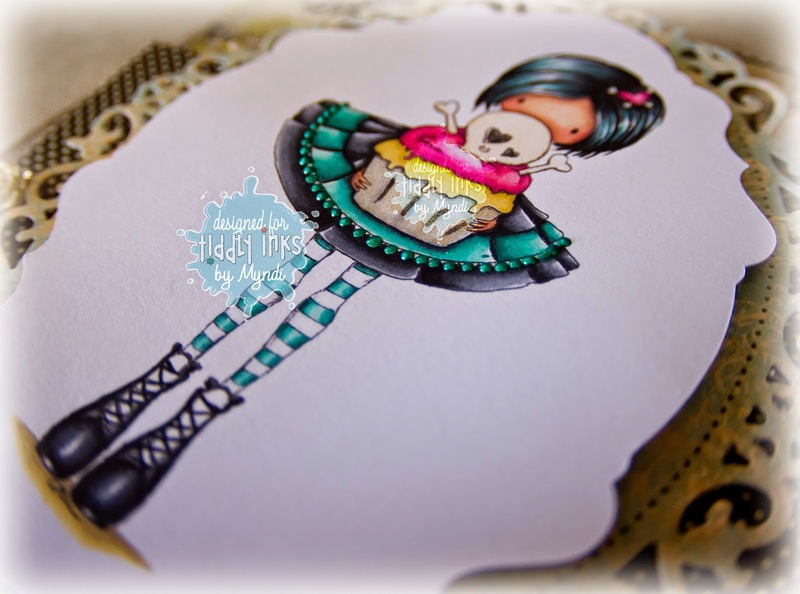 It is Fab Friday at Tiddly Inks and this week I have inked up a Sweet Tooth called "Semi Sweet" for some DT inspiration. I coloured this image with Copics, using BG10-18 and C3-C9. I put a little BG15 in her hair to funk it up a bit. I love some funky coloured hair! I used a Clear Star gel pen for the cupcake wrapper. In the top left and bottom right corner I stamped a little circle of dots and then applied aged black Frantage over it. I used a Spellbinders die for the back mat of the image. The digital papers are from Spunky Tart. They are called Don't Stop and you can find those HERE. The polka dot paper is just some leftover paper I had in my stash. Here is a close up of her skirt, where I used Liquid Pearls for the ruffle on her skirt. Lucky for me I had a colour that matched exactly the colour I used, since I didn't have the idea until AFTER I coloured it. These are some of the cutest little roses I have seen. I think they are made out of resin. They are from Tim Holtz, and they are cream coloured, so I brushed some gold Viva Decor paint on them. 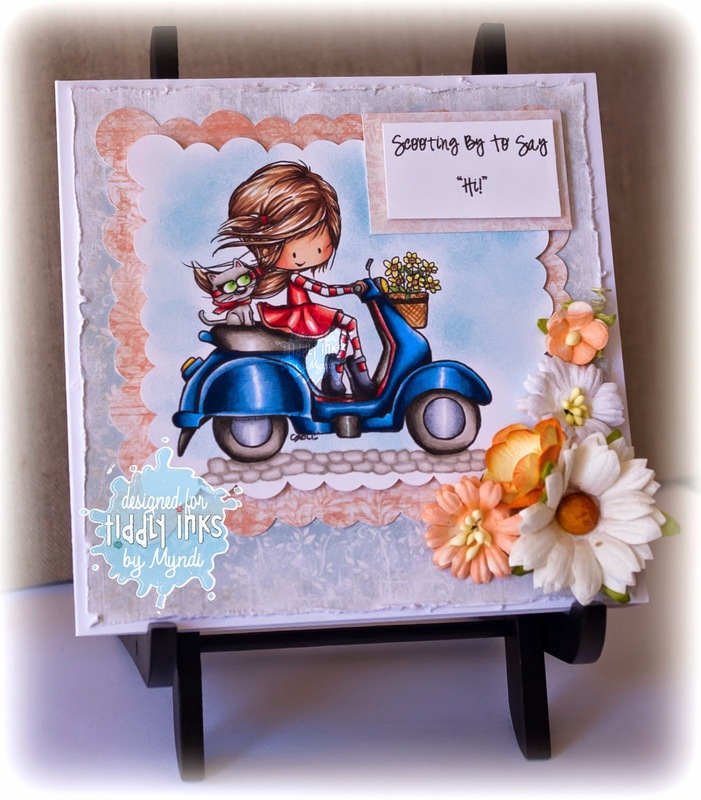 Make sure you head over to the challenge blog to enter into the May Flowers challenge. It's almost over! Just a couple more days left to enter! Thanks so much for stopping by and taking a look at my newest Tiddly Ink make! Feel free to leave a comment below! I love to hear from you! Over at The East Wind's Facebook page we just started a "For The Guys" challenge. It could be quite the challenge because most TEW images are based around Lucy Loo and Aurora, very feminine images. You are going to have to think outside the box for this one! Let us see what kind of "Guy" themed project you can come up with. I used Yogibunny 'Savasana' to make a birthday card for a "Dude". I coloured him very lightly with Copics W3, W1, W0. I used digital papers from Spunky Tart called Gough It Up. They are so lush and richly coloured, and perfect for a guy's card. We are also running a contest over on Instagram for the chance to win two free images of your choice. Just post any TEW project and tag it with #tewcard01 and #theeastwind. Unky and I will be checking them out regularly to see what you are up to. A winner will be chosen by random draw on May 31. Now go get crafty with some TEW images and show us what you got!! 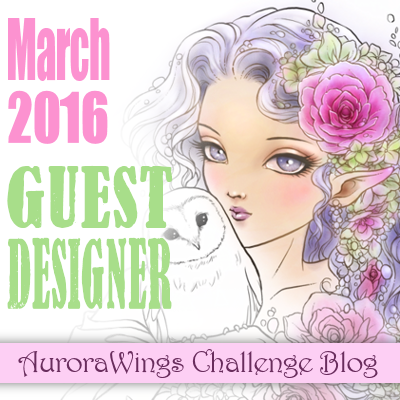 Another new challenge is going on over at Open-Minded Crafting Fun. The theme this time is Wedding or Anniversary. The deadline for the challenge is midnight on May 22, 2015. Winners will be announced on May 30. 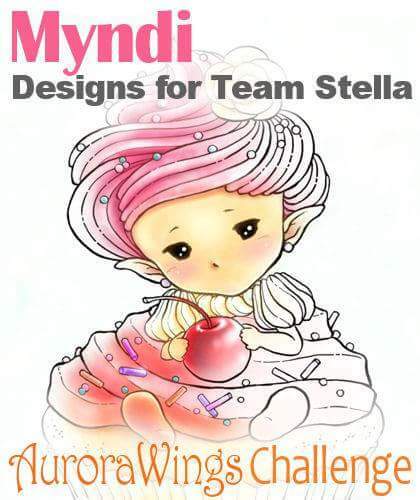 The sponsors for this challenge and their prizes are: Beansie Doodles (5 images), Di's Digi Stamps ($12 gift certificate), Fairy Tangles (2 images), Illustrations by Jane (2 images), My Whimsical Little World ($8 gift certificate). I used Froggy Prince by Beansie Doodles for my DT project. I think it makes a cute anniversary card! I actually had a lot of fun colouring the frog and trying to make him look realistic. I just had a play and I think it worked out. It helps that I was reading about frogs to my kids and I had so many different ideas. I ruled out colouring a poisonous dart frog though, because really, who wants to kiss one of those?? I coloured the frog with Copics and the paper is from the DCWV Latte stack. Our sponsors for this challenge are offering up some great prizes for some randomly drawn winners, so make sure you head over to OMCF and show us what you were inspired to make. Hello everyone, and Happy Friday!! It is a long weekend here in Canada, and of course the weather is supposed to be lousy. I will take that as an opportunity to craft as much as possible! 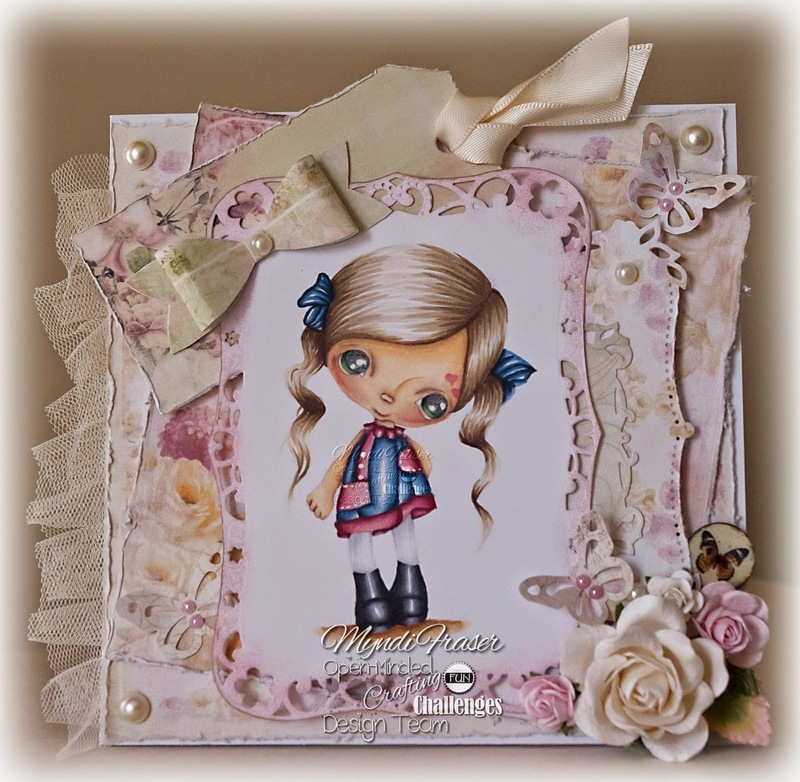 Today I have a new release from Ppinkydolls and another that she released last month. They are both super cute!! The first one is "With My Pet". She was just released a couple of days ago. How precious is she?! I used Copics to colour her, and Shabby Blue Charms digital papers from Michele R. I tried to link back to the papers, but it appears the Shabby Blue isn't available anymore. Check out her shop HERE though. She has a lot of beautiful papers to choose from. I punched the butterflies out with a Martha Stewart punch; the flowers are from Wild Orchid Crafts. I used a By DieZyne stitched bracket die for the image. The next one is "Abi". I coloured her up for the Etsy shop and finally got around to putting her on a card. She is probably one of my favourites! I also coloured her with Copics after cutting her out with a Spellbinders Nestabilities Floral Ovals die. 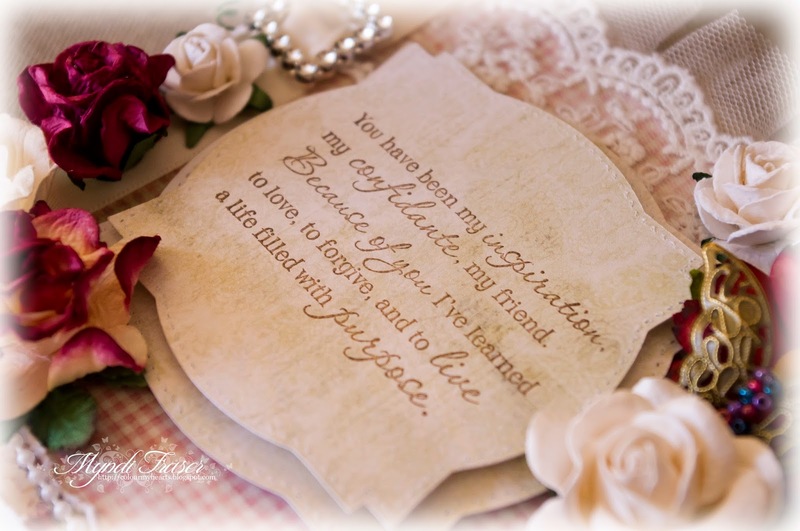 I used Michele R Vintage Flowers digital papers and flowers from I Am Roses. The lace is from Live & Love Crafts. 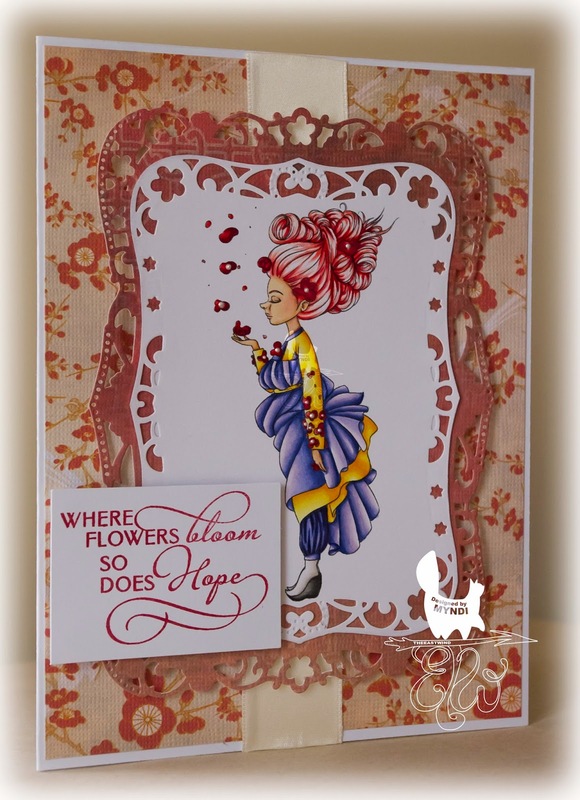 I really love Ppinkydolls for making shabby themed cards. I think they work really well. For anyone interested in colouring Ppinkydolls, you might want to lighten the image before printing so the shading isn't so dark. It is the question I get asked the most, "Why doesn't yours look as shaded as the one in the store?" I always lighten the image before printing. I then have to go over their eyes with either black colour pencil, or I use W7 or W9 to darken those black areas back up. Make sure you check out the Ppinkydolls Facebook page for monthly contests and occasional freebies!! Today is the start of a new challenge at Tiddly Inks and the theme is "May Flowers." You can use flower themed papers, images or stamps with flowers, flowers as embellishments, or even make your own flowers. I used the new image Scooting By w/Kitty for my DT inspiration make this week. Head over there and show us what you got! The papers I used are from Michele R Designs (the Coral Chic paper has flowers on it), and the flowers are from Wild Orchid Crafts and I Am Roses. I coloured the image with Copics. I went on a shopping excursion to Michaels (a really big craft store here, for those of you who don't have them), and with a list of two items, left with about 20, including my new little easel and a tan linen canvas board I found for staging my cards. I really like the way the photos are turning out now that I have dressed up my staging area. I also invested in some multimedia supplies, so I will have to have a go at that in the near future instead of just making cards all the time. Wish me luck with that endeavor. Only cards with Tiddly Inks images or Stamping Bella rubber stamps please. Challenges must be entered by 10 PM on the following Monday. We choose One winner per challenge and a top 3. The winner will receive $6 of Tiddly Inks images. The winners are posted on Friday following the end of the challenge. Come and Get It - Got Flowers? 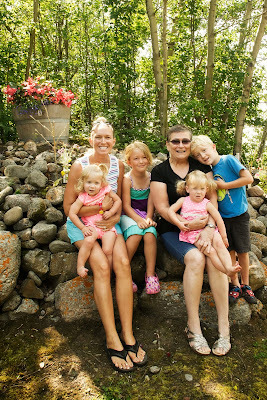 Happy Mother's Day to all you moms out there! I hope you get to take it easy today and let the men in your life take care of you, or your children, or whoever your significant others are. 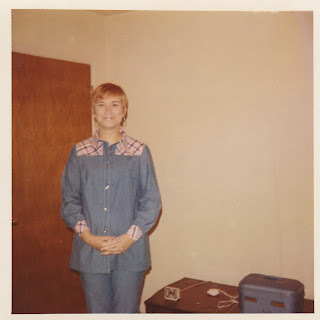 I decided to do a post for Mother's Day because I went to mail my mom's card and they wanted almost $20 to mail it. Well, I'm pretty cheap when it comes to things like that. If I weren't seeing her in a few weeks I would have went ahead and mailed it, but we will be going to my oldest daughter's high school graduation at the beginning of June, so I think she'll understand if I just bring it to her then. I don't think she would mail a card for $20 either. Anyway, I decided to write a blog post for her as a little present and so she can see the card I made for her. My mom and I don't live close to one another. She lives in Kentucky and I'm in Alberta, so we only see each other a couple times a year. That is hard for someone like myself who is a self-proclaimed mama's girl. I cried, and I mean cried, when I left home. It was very hard for me. Since then, we've rarely been in the same state, or the same country, or even on the same continent for that matter. We had a few years that we both lived in Florida, so that was awesome, but now here we are again in different countries. My mom worked really hard as a single parent to raise my sister and I. It wasn't easy and I admire her and love her for it more than I can ever tell her. So Happy Mother's Day Mom!! I love you more than it is possible to tell you!! 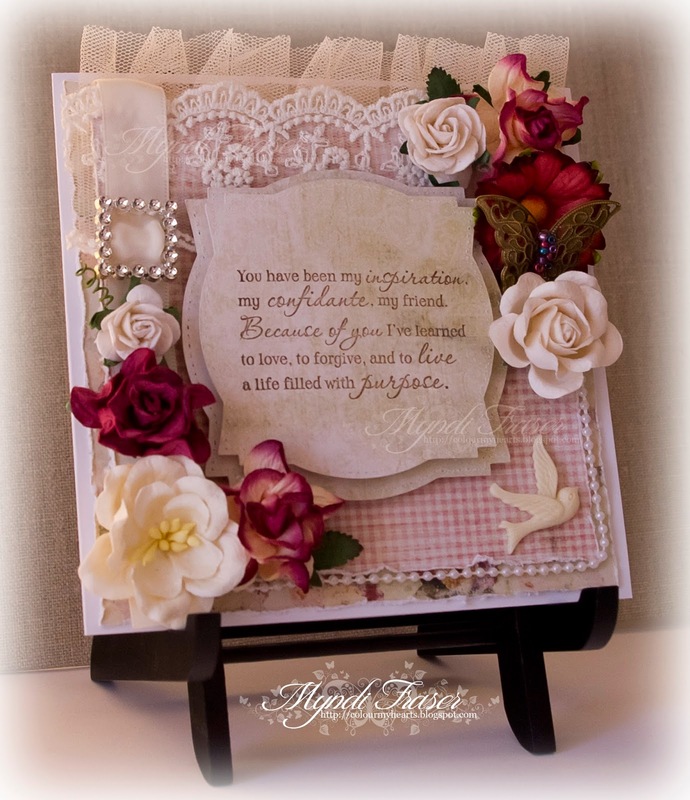 On my card, the flowers are from Wild Orchid Crafts and I Am Roses. The lace and the pearl string are from Live & Love Crafts. The dove is from Wild Orchid. 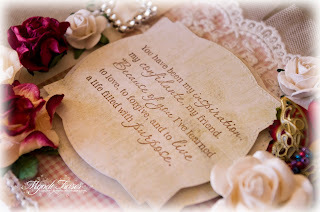 I used Vintage Flowers digital papers from Michele R Designs. 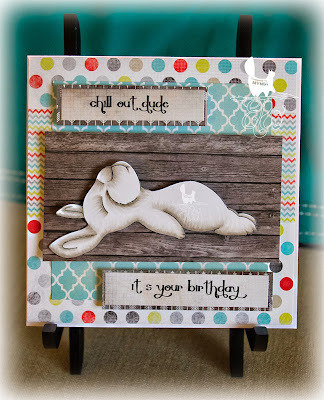 This sentiment is from Verve Stamps. 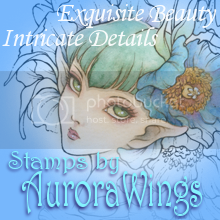 I stamped it with Color Box Espresso pigment ink and heat embossed it with Recollections clear detail embossing powder. 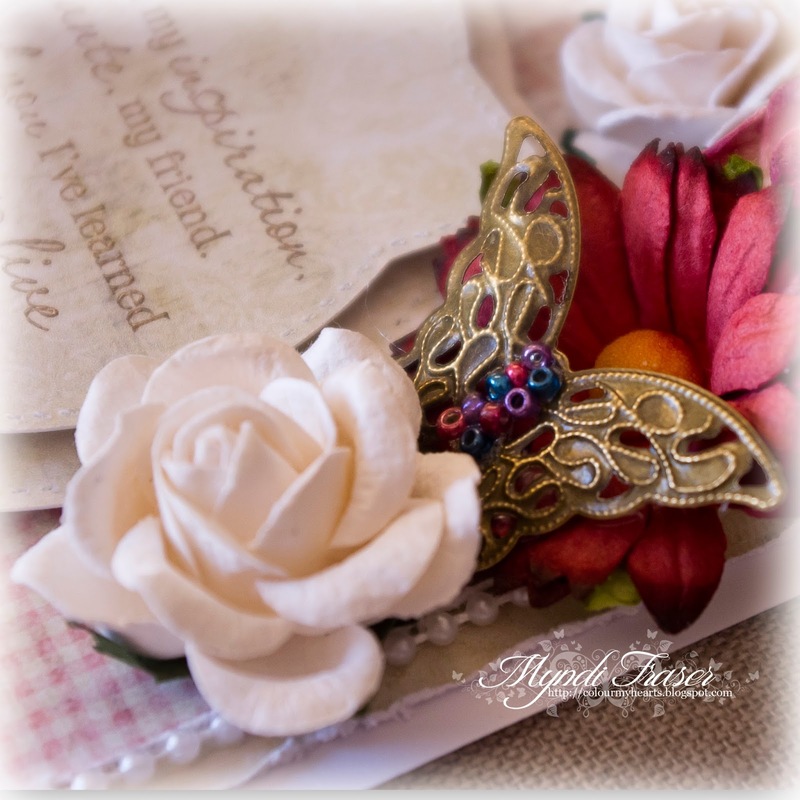 The butterfly is from Live & Love Crafts. I glued glass beads on for the body. I got that idea from tofa. She has some fantastic projects on her blog. Check her out HERE! In addition to the new stamp that was released by Slinky Tart this week, Tamara has also started creating digital papers, and they are fabulous! 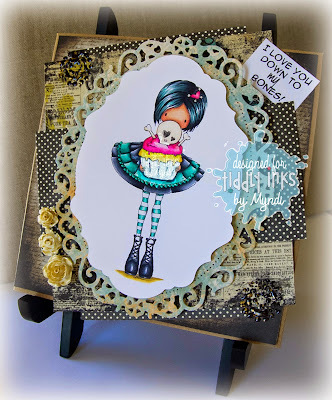 So this week I made two projects with Slinky Tart images and one of them is with her set of Don't Stop digital papers. I used the image Trudie's Tribute, which was a special digi Tamara did for our honorary Slinky Trudie Howard. I also used the sketch for the sketch challenge we are having in our Slinky Tart Facebook group. My next project was done using the new digi "So Annoyed...times 8". I kept it simple and only used a Cricut embossing folder for the base. For both cards, I coloured them with Copics. It looks like I'm really into aqua blue this week. lol! Thanks for stopping by and checking out my Slinkies! I hope you like them and are inspired to colour up a Slinky yourself. Also, Tamara is holding a GDT call, so post your makes on the wall of our Slinky Tart group and maybe she will pick you to join us for a month. This is so exciting for me, I can not even tell you or express it to you through a blog post! If you follow me, you know I submitted an entry to Tiddly Inks to be on their Design Team... and I made the team!!!! I am so excited! Tiddly Inks was one of the very first digis I ever bought and coloured. To be on the DT is a real honour and I am thrilled to be working with some really awesome ladies! Check out all the new ladies HERE! 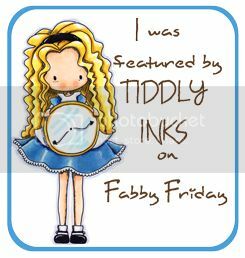 So getting to the business at hand, today is Friday... Fabby Friday to be exact, and that means a Tiddly Ink DT make from me! I am using the new release Love You Mostest. I kept it clean and simple, with just a little shabby pink Frantage for bling. 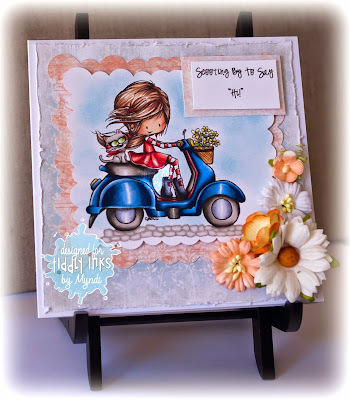 The sentiment is by Verve Stamps. I stamped it in silver pigment ink and then heat embossed it with clear embossing powder. I added a little layer of lace from Wild Orchid Crafts and matted it on pink shimmer cardstock, then matted that on the polka dot cardstock from DCWV. Nice and clean, and perfect for a wedding or anniversary. Well, that's it from me today for Tiddly Inks! Make sure you check out the SHOP and the BLOG, and sign up for the newsletter! There's always great info in there about FREE images and discounts, so you don't want to miss any of that! I coloured her with Copics, and used Michele R Designs Philomena digital papers. Ribbon is from Michaels craft stores, and the flowers are from I Am Roses. 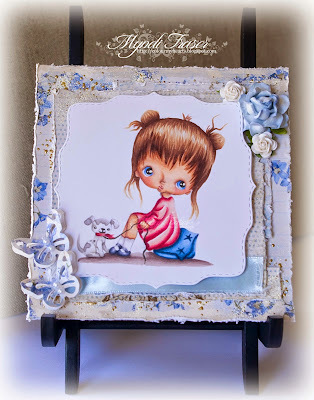 Another challenge is on at Open-Minded Crafting Fun Challenges, and the theme is Shabby Chic. As usual, we have some awesome sponsors offering some awesome prizes for this challenge: Kith & Kin Digital Stamp Co. (5 images), All Dressed Up (2 images), Ppinkydolls Art (3 images), and The East Wind (3 images). The deadline for this challenge is midnight on Friday, May 8. The winners for the prizes from our sponsors are chosen by random generator, so everyone has an equal chance of winning. Don't be afraid to join in! Winners will be posted on Saturday, May 16. I used an image from Ppinkydolls Art called "Mily." As luck would have it, after I chose to do a Ppinkydolls image for this challenge, Chrishanthi (the artist at Ppinkydolls) asked me to be on her DT! And she asked me to colour this image up for her to post in her Etsy shop. So if you click on my "Mily" link and see that the Mily in the shop is coloured the same as the Mily on my card, it's because it is one and the same. I didn't copy the shop one, I coloured the shop one! lol! I used Michele R Design Shabby Chic digital papers and Elements, flowers from Wild Orchid Crafts, Majestic Labels eight die set by Spellbinders, a butterfly punch by Martha Stewart Crafts, and the ruffled lace is from Live & Love Crafts. I coloured her with Copics. 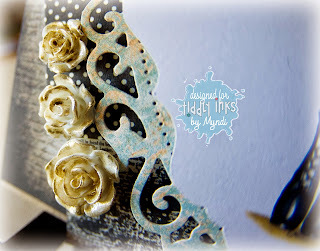 I inked up the edges of the image with Victorian Velvet distress ink by Tim Holtz. I used coordinating papers from a DCWV Far East mat stack, and Spellbinders Majestic Labels Eight Die Set. Make sure you join us on our Facebook page for our current challenge "It Started With a Song," and check out the BLOG for the new "Mother's Day - Add Flowers" challenge starting today! Make sure you are signed up for the newsletter (look for the bright pink box at the top of the page) so you are getting the FREE IMAGE on the 1st of each month. May's freebie is a real cutie!